When you have a company that makes many different types of optical devices and gears some of them towards hunting, it’s only natural that they would want to get into making trail cameras. That’s exactly what Bushnell decided to do many years ago. It’s a venture that has paid off nicely for them. 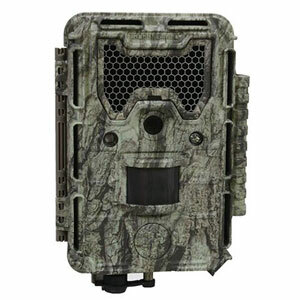 They now have some of the best-selling trail cameras in the hunting marketplace. Let’s read more in Bushnell’s best game camera reviews and learn a little bit more about what they do best when designing trail cameras. If you want to know even the smallest details about the game animals that frequent a certain area of land you better have a trail camera with good resolution. That’s exactly what you get with the Bushnell 119875C 24MP Trophy Cam. It offers the best photo resolution you will ever find on a trail camera. With its 24 megapixels of still photo resolution, you will even be able to identify small markings on any animal that you would like to hunt in the future. High resolution still photos are not the only thing you can take with this model trail camera either. It also shoots excellent short bursts of HD quality video. You won’t miss many shots with it because of its fast trigger speed and recovery times. It will take a photo in just 0.25 seconds after it detects movement and is ready to take another photo in an industry leading 0.5 second recovery time. That makes it the perfect game camera for those who like to take multiple photos at one time. 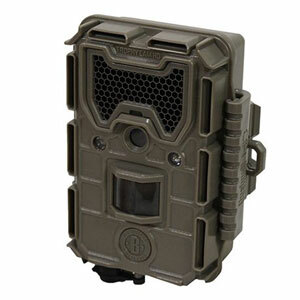 The list of great features with this model trail camera seems to just go on and on. 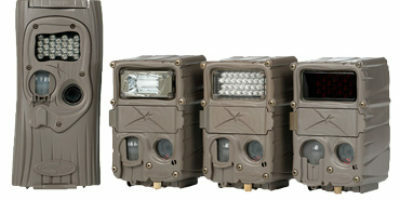 Bushnell chose to use Low-glow LED infrared flash bulbs for greater flash distance. This camera will brightly light up an area up to 100’ in front of the trail camera. They have even designed the motion sensor found in it to match this lengthy 100’ distance. You even have easy to use preset menu choices and its 5 programming buttons are backlit for simple low light viewing. It has a true 1-year battery life if it is programmed correctly also. 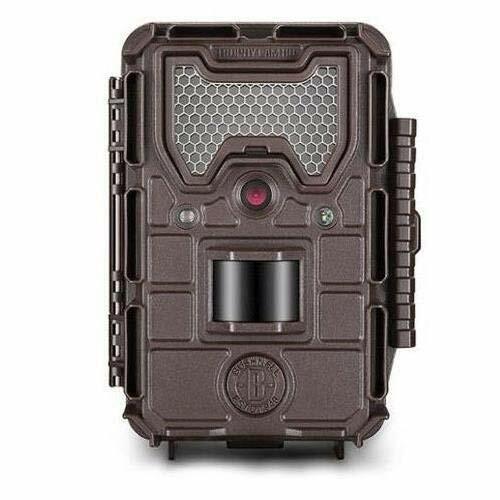 Are you looking for a trail camera that is loaded with quality features but won’t break the bank? Then you will certainly like what you hear about the Bushnell Trophy Cam E3. It has many high-quality features without the hefty price tag that normally accompanies them. It makes scouting for the game much simpler and less time-consuming. Normally in a trail camera in its price range, you will not find 16 megapixels of photo resolution but this trail camera has just that. It also shoots up to 60-second bursts of HD quality video. This trail camera also has an adjustable trigger speed and incorporates aspects of Bushnell’s ‘hyper’ technologies. These technologies do such things as boost nighttime photo taking and motion sensing ranges. Its low-glow LED’s will light an area in front of the camera up to 100’. It’s also ready to snap another photo in less than 1-second after it takes the first photo. You will also get exceptional battery life with this trail camera model too. If you program it according to the directions its battery life will last you almost 1-year. It’s a game camera model that is backed up by an adequate 2-year warranty also. 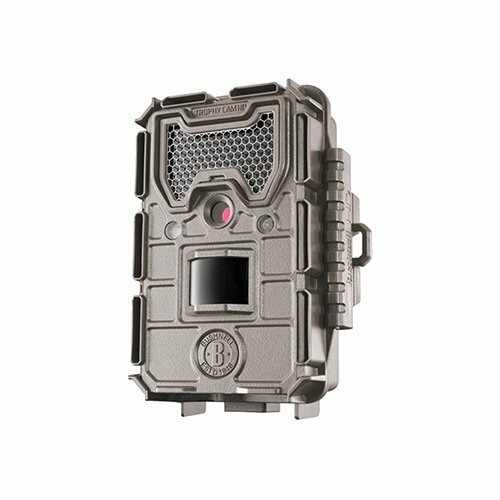 Maybe you don’t need or want a top of the line trail camera but you still want a model with some good features at a respectable price? That perfectly describes the Bushnell Trophy Cam E2 trail camera. It offers many of the same good features as Bushnell’s higher priced game cameras without the price tag that comes with them. This is one of Bushnell’s most budget-friendly trail cameras. It features more than adequate 12 megapixels of still photo resolution and it takes HD quality 720P video too. 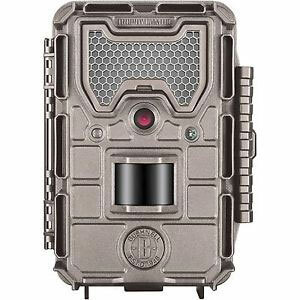 You can set this trail camera to take photos in up to 3 images at a time or in up to 60-second bursts of video. It has both an excellent nighttime flash and all-around motion sensing range too. Its bright low-glow LED flash will illuminate an area up to 100’ in front of the camera. The motion sensor on it will set off its rapid 0.3-second trigger speed when a moving object approaches within 80’ of the front of the camera. This is a trail camera that’s built tough too. It operates well even when it’s slightly below zero degrees outside or when it’s an extremely hot day. The battery life on this model trail cam is very good too. If you follow the programming instructions it the batteries will last up to one year before they need to be changed. Most trail camera companies when they make a game camera that only has 8 megapixels of still photo resolution they are making an entry-level type trail camera. This is hardly the case with the Bushnell 8MP Trophy Cam. It offers many outstanding features that simplify scouting an area for the game. Not only does this camera take decent 8 megapixel still photos but it will also shoot HD quality video (720P). Both its day and nighttime still photos are shot in full color too. It has a very good nighttime flash range of 60’ and its motion detection technology will work in that same range too. Other nice features on it include its field scan mode and its fast 0.6-second trigger speed. You also have several easy to use photo and video taking modes you can program into it. These include such things as setting the camera to only take daytime photos or only shoot photos at night. Do you like to scout for the game with a trail camera but you don’t have time to go out in the field to retrieve the photos and video it’s taken? Well, you no longer have to. Bushnell now offers a completely wireless trail camera that will send the photos it takes to your mobile phone, computer or smart device. Now even if you have little time to go into the field you can still efficiently scout for the game without leaving your home. With this camera, you connect to several different wireless providers. You also get an excellent 14 megapixels of still photo resolution with this Bushnell wireless trail camera and high-quality HD video (720P). Bushnell believes in making trail cameras that work well at taking nighttime photos. This one has several of what they refer to as their ‘hyper’ technologies. These include both expanded (60’) nighttime flash and motion sensing ranges. If something moves in front of this trail camera you will get a video or still shot of it. 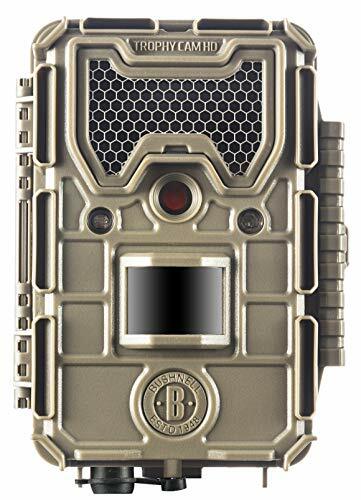 Other nice features on this game camera include such things as its simple setup on its LED viewing screen, its long 3-month battery life (follow the directions to achieve this) and its 48 low-glow LED infrared flashbulbs. This is definitely one of the better wireless game cameras you will find. 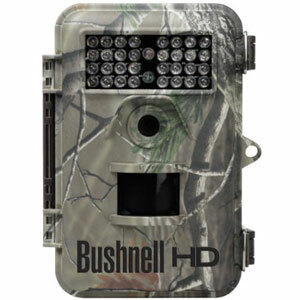 Here is another high-quality trail camera from Bushnell that offers superior still photo resolution. You can tell much from a photo of an animal that is taken with 20 megapixels of photo resolution. That is an area of photo resolution that professional photographers work within. 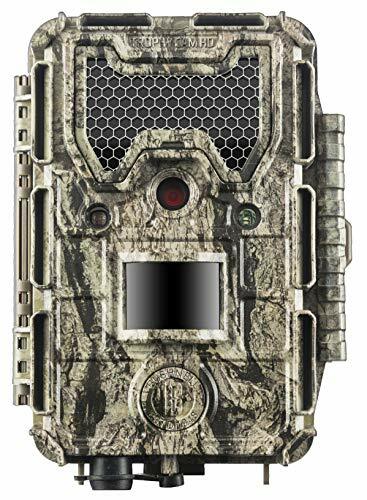 With this trail cam, you can also shoot up to 60-second bursts of 1080P HD quality video. It takes excellent night and day photos of any game that appears in front of it. Its nighttime photo taking capability is enhanced by its 100’ low-glow LED flash range and its accompanying 100’ motion sensor range. This game camera is all about having speedy features. Once motion is detected in front of the trail camera it will snap a still photo in under 0.3 seconds. It offers a rapid photo taking recovery time of fewer than 0.6 seconds too. These are among the most impressive trigger and recovery times you will find in the industry. 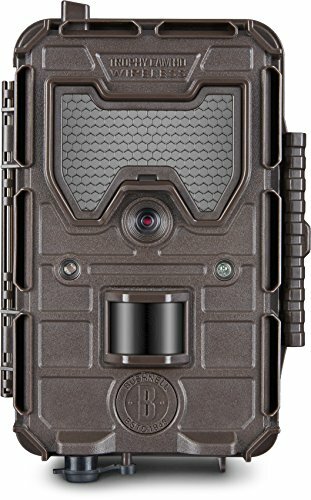 When you are a company that specializes in making devices that include specialized optics you would expect them to make a trail camera with good photo resolution. Bushnell does exactly that. Many of their trail cameras have a higher still photo resolution than comparable models from their competitors. 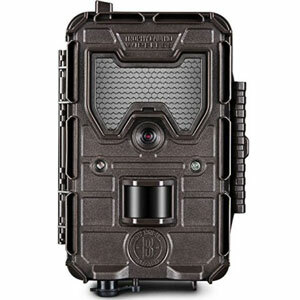 They make some of the very highest still photo resolution trail cameras you will find in the marketplace. Bushnell likes to make programming their trail cameras easy too. Many features built-in LED or green screens for this purpose. They also use many preset modes so you don’t have to spend a lot of time programming in a commonly used photo and video taking modes. You may have noticed as you were reading our short reviews of the Bushnell trail camera products that many of them have a very fast trigger and recovery times. That is one of the things that Bushnell trail cameras are known for. It makes them a great choice for those that like to use multiple photo taking bursts when setting their trail cameras to scout for game. 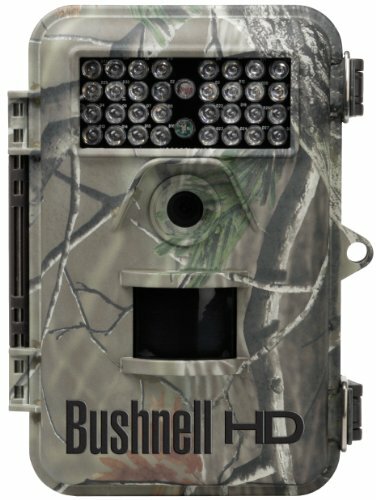 Other features that seem to be the norm on Bushnell game cameras are there extended nighttime flash and sensor ranges. 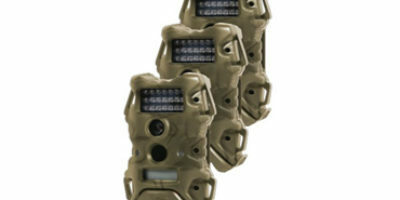 On many of their trail cam models, these will extend out to up to 100’. They are able to do this by using what they call their ‘hyper’ trail camera technologies. Bushnell has a solid reputation for standing behind the products that they sell. They back up all of their trail camera products with a full 2-year warranty. This is pretty much standard in the industry but their reputable customer service team makes it even better. They also offer a 90-day return policy if you are not satisfied with your purchase. What does the future of Bushnell game cameras hold? We think from what we have heard they will become one of the leaders in Wireless trail camera production. They already have one of the best cellular trail cameras in the marketplace with the Bushnell Trophy Cam Aggressor Wireless Trail Camera. 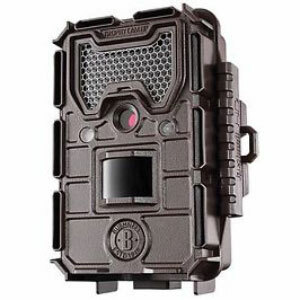 Look for them to add even more cameras to their wireless trail camera line as the technology becomes even more popular. If we sound a little biased toward Bushnell trail cameras as we report on them forgive us. It’s just that we feel their cameras always deliver more than similar models from their competitors. It’s a really impressive trail camera line, to say the least. We love the higher photo resolution they put in many of their camera lines and they have fast trigger and recovery times too. As stated in all Bushnell trail camera reviews, their line of trail cameras also offers excellent nighttime photo taking capabilities. That brand is definitely worth checking out a little closer if you are in the market for higher quality trail cameras.